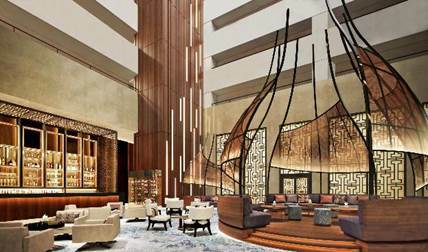 InterContinental Hotels Group (IHG®), one of the world’s leading hotel companies, has opened the doors to InterContinental Hanoi Landmark72 in Hanoi, Vietnam. Boosting the city’s fast growing MICE (meetings, incentives, conferences and exhibitions) profile, the new hotel offers luxury accommodation and state-of-the-art meetings facilities, including the largest pillar-less ballroom in Hanoi. Located in the heart of West Hanoi’s newest Từ Liêm business district, InterContinental Hanoi Landmark72 is less than 40 minutes from Noi Bai International Airport, promising guests a smooth transit via the high-speed Nhat Tan Bridge. Surrounding the hotel are the headquarters of many multinational corporations, and the well-known Vietnam National Convention Centre, is only a five-minute drive away. The hotel is the only luxury hotel within the wider Landmark72 integrated complex, which comprises retail, commercial, and entertainment offerings. In addition to its strategic location, InterContinental Hanoi Landmark72 is poised to attract MICE organisers and travellers to its state-of-the-art and versatile meetings spaces, totalling 2,861 square metres with eight function rooms ranging from 70 to 920 sqm. The hotel boasts one of Hanoi’s largest pillar-less ballroom that accommodates up to 1,000 people, which is complemented by the largest ballroom foyer (1,020 sqm) in Hanoi, perfect for large conferences, exhibitions and glamorous social events. Only moments from the meeting spaces, the hotel’s Meeting Instant Service team are on-hand to provide a seamless service from start to finish. Perched atop the towering Keangnam Landmark72 and occupying the 62nd to 71st floors, the hotel is the highest in Vietnam. Guests can check into one of the 359 sophisticated and luxurious rooms, including 34 spacious and well-appointed suites, all offering panoramic views of Hanoi’s skyline through floor-to-ceiling windows from over 300 metres above the city. The hotel features four showpiece restaurants, bars and lounges in total. All located on the 62nd floor they provide the highest dining experiences in the region. The sky-high dining and drinks offering includes: 3 Spoons, with triple market-style kitchens each serving unique cuisines, Hive Lounge, an exquisite lounge and centrepiece of the hotel’s lobby, Q Bar, and Stellar, the hotel’s signature restaurant and steakhouse. Furthermore, InterContinental Hanoi Landmark72 guests will benefit from IHG’s latest connectivity offering, IHG Connect, which makes its regional debut in Vietnam. Recently launched in the US, IHG Connect delivers a faster, more reliable and consistent hotel Internet guest experience by combining significantly increased bandwidth and state-of-the art, cloud-based Wi-Fi technology. A key component of IHG Connect is the auto recognition feature for IHG’s loyalty members, where guests only need to sign in once to access hotel Wi-Fi at all IHG Connect-enabled hotels. They will automatically be connected for all future visits and will roll-out in the rest of South East Asia in the coming months. Across South East Asia, there are 17 InterContinental hotels and resorts with 11 more due to open in the next three to five years. InterContinental Hanoi Landmark 72 is the second InterContinental in Hanoi, joining the InterContinental Hanoi Westlake located close to Hanoi’s famous Old Quarter. For more information on InterContinental Hotels & Resorts, visit www.intercontinental.com.